The hospital that we are serving today began on December 10, 1906, as a small clinic, the Dispensaria Betaña in a Bible School for women along Rizal Avenue in Sta. Cruz, Manila. The room was offered by the principal of the Bible school at the request of Dr. Rebecca Parish, a missionary doctor from Indiana, USA, sent by the Women’s Foreign Missionary Society of the Methodist Episcopal Church of the USA. The clinic had Dr. Parish as the doctor, and along with her were three young Filipinas loaned from the Bible School to assist her. For equipment, they had a desk, a chair with three awry legs, an enameled bowl, and a pitcher with most of the enamel off. As crude as the clinic was, it overflowed with patients every day. The password was simply, “May sakit po ako”. A pharmacist and an interpreter were added as helpers. That was all, but it was the humble beginning of a great medical missionary institution. The hospital transferred to its present site in 1908. The cost of the lot and the first building was paid from a gift of $12,500 given by Mr. Daniel S.B. Johnston, a Methodist layman from St. Paul, Minnesota as a memorial for his late missionary wife, Mrs. Mary Johnston. The original building of the Mary Johnston Memorial Hospital was a two-story building with stone and frame structure and galvanized iron roofing, housing 55 patients. The work of the hospital had scarcely begun when they were found to be in the throes of a cholera epidemic, not only in Manila, but all the surrounding provinces. Mary Johnston Hospital became a cholera hospital for weeks but this public service gave the hospital a standing which helped much in those early years. At the out- break of World War II, the hospital became an emergency hospital where the wounded from air raids were hospitalized. 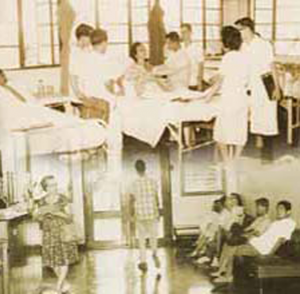 Victims from the Cavite Navy Yard bombings were brought to the hospital and thus the Hospital for Women and Children, for the first time, became a general hospital for all sexes and ages. The hospital in its early years received partial subsidy from the government as a token of appreciation for the work being done in the needy district of Tondo especially its Milk Station which was keeping alive many babies by daily milk feeding but this too was stopped with the passage of the Jones Bill in 1917 which prohibited government money to be given to sectarian institutions. And so, the hospital carried on through the years with a wonderful ministry to all types of illness of women and children inspite of fires, earthquakes, typhoons, and financial problems. Patients poured into the hospital. The neighbors sought shelter with MJH thinking that it might escape disaster but on February 5, 1945, the hospital succumbed to the fires. All was burned except the skeleton of a concrete porch upon which still hung the sign Surgical, Obstetrical, and Pediatrics Dept’s, and an Out-Patient Dept. and Public Health Unit. To the staff, this became a symbol of things to come, that out of the ruins of what was once the hospital would arise a bigger and better hospital. 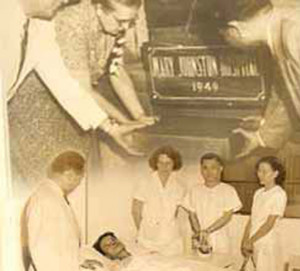 A bigger, more complete, and modern hospital was inaugurated on August 26, 1950 in an impressive service, at which no less than the late President Elpidio Quirino was the guest speaker. It was now a general hospital ministering to men, women, and children; a hospital modern in every way with an X-Ray Dept., Laboratory, a complete Medical, Surgical, Obstetrical, and Pediatrics Departments, and an Out-Patient Dept. and Public Health Unit. To quote from Pres. Quirino’s address at that time of the inauguration, “I wish there were more hospitals in the country that could render as much service as this hospital has rendered”. Today, Mary Johnston Hospital is accredited by the Department of Health, the Philippine Health Insurance Corporation, the Philippine Hospital Association and the different specialty societies as a tertiary and training institution. It has a recognized residency training program in the four clinical departments – Internal Medicine, Surgery, OB-Gyn and Pediatrics. Hundreds have graduated from the residency training program majority of whom are now successful and respected specialists in their respective field. Mary Johnston Hospital today still continues to pursue the mission of Dr. Parish. Undaunted by the high cost of medical service, she nevertheless persists in providing the best service available. As it was in Dr. Parish’s time, MJH today accepts all who come to her, whatever color, creed, religion or political persuasion. Even with the very limited resources at hand, she strives to give the best service she can afford, the reason why she has always been known for quality service. Her staff is dedicated people, committed to the cause of love expressed concretely in Devoted Service.